We dubbed the vulnerability as SambaCry, because of its similarities to the Windows SMB vulnerability exploited by the WannaCry ransomware that wreaked havoc across the world over two months ago. Despite being patched in late May, the vulnerability is currently being leveraged by a new piece of malware to target the Internet of Things (IoT) devices, particularly Network Attached Storage (NAS) appliances, researchers at Trend Micro warned. For those unfamiliar: Samba is open-source software (re-implementation of SMB/CIFS networking protocol), which offers Linux/Unix servers with Windows-based file and print services and runs on the majority of operating systems, including Linux, UNIX, IBM System 390, and OpenVMS. Shortly after the public revelation of its existence, the SambaCry vulnerability (CVE-2017-7494) was exploited mostly to install cryptocurrency mining software—"CPUminer" that mines "Monero" digital currency—on Linux systems. However, the latest malware campaign involving SambaCry spotted by researchers at Trend Micro in July mostly targets NAS devices used by small and medium-size businesses. Once deployed on the targeted machine, the malware establishes communication with the attackers' command and control (C&C) server located in East Africa, and modifies firewall rules to ensure that it can communicate with its server. After successfully establishing a connection, the malware grants the attackers access to the infected device and provides them with an open command shell in the device, so that they can issue any number and type of system commands and eventually take control of the device. In order to find the affected devices that use Samba, attackers can leverage the Shodan search engine and write the original malware files to their public folders. "It is quite easy to find devices that use Samba in Shodan: searching for port 445 with a 'samba' string will turn up a viable IP list," researchers said while explaining the flaw. "An attacker would then simply need to create a tool that can automatically write malicious files to every IP address on the list. Once they write the files into the public folders, the devices with the SambaCry vulnerability could become ELF_SHELLBIND.A victims." However, it is not clear what the attackers do with the compromised devices and what's their actual motive behind compromising the devices. The SambaCry vulnerability is hell easy to exploit and could be used by remote attackers to upload a shared library to a writable share and then cause the server to load and execute the malicious code. 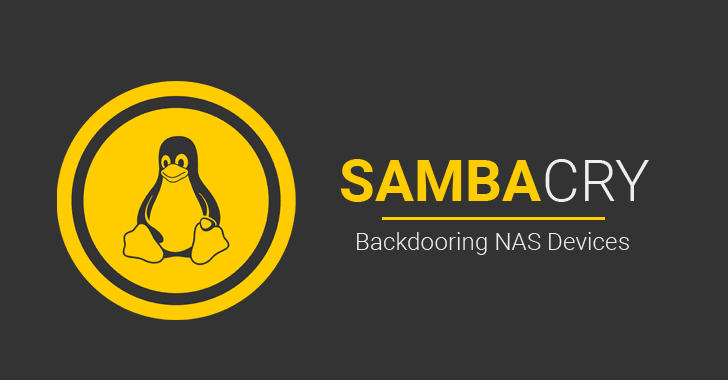 The maintainers of Samba already patched the issue in Samba versions 4.6.4/4.5.10/4.4.14, so you are advised to patch your systems against the vulnerability as soon as possible. Just make sure that your system is running updated Samba version. Also, attackers need to have writable access to a shared location on the target system to deliver the payload, which is another mitigating factor that might lower the rate of infection.